“Origin of Game Name: Zero Gordian — a combination of ‘zero Gravity’ [the common term for micro-gravity] and ‘Gordian’ [as in the famously complex “Gordian Knot” of myth and legend]. Teams: Zero Gordian is a team sport, with each team consisting of two ‘astroletes’ (no more) and with a minimum of two teams competing (any number of two member teams may compete (see ‘Alternative Play’ section, page 4). Preparation/Equipment: a fluorescent (painted) tether (about one inch thick) of sufficient length (maximum of 20 feet/6 meters) is attached at each end (via a Velcro cuff or linking loop) to one of the team member astroletes. The tether attachment points can be the ankle, waist, or wrist (the choice is up to each team or team member). Thus, each team member constitutes one end of a “rope” that is to be tied (with the two ‘hands’ replaced by the bodies of the two astroletes, etc.). The Game Space/Arena: The game takes place in a micro or zero-gravity “arena” with ideal minimum dimension of 15[L]’ x 15[W]’ x 12 [H]’. The ideal arena space (minimum dimensions), as well as the ideal length of the tether, will need to be determined (perhaps during parabolic test flights) but should allow, at minimum, tethered teammates to pass over/under and around each other with relative ease (to perform actions needed for the tying of the knots). This arena could be a separate module attached to the ISS, for example, or, ideally, a (domed) micro-gravity plane on the Moon or Mars (note: in the accompanying animation, the game appears to take place in “free space” [zero-gravity] but perhaps could be a transparent, domed arena). Game Action: Teams randomly select a knot (or may choose a knot after an initial successful knot-tying) from an array/display* of illustrated knots arranged in three rows, indicating varying/increasing degrees of difficulty; levels 1, 2, 3. For example, an over-hand or figure eight knot would be deemed Level 1 knots (the simplest or ‘mini-g’), with a lariat loop or Stevedore’s knot being Level 2 (medium difficulty; ‘midi-g’) and a fisherman’s eye or midshipman’s hitch being a Level 3 knot (most difficult or ‘maxi-g’). Teams then attempt to replicate (“tie”) the selected knot (while “floating” in space/micro-gravity) in the fastest amount of time – with a maximum time limit of two minutes for any knot. At the 2-minute mark, a “bell” is sounded to terminate that knotting. The game may be played in relative darkness with only/mostly the fluorescent (“glow in the dark”) tether visible; this would make evaluating the accuracy of the replicated knot somewhat easier [see note, below] and may also aid the tethered teammates in more rapidly executing the knots and/or untying them. *Note 1: [see: the concept design sheet accompanying this application] the knot array/display can be a “zoom-able” touch screen or a 3D image, with a side-by-side (and fully rotatable) display function showing the original selected knot and the photo-recorded, “finished” knot tied by the astrolete team. This allows the knottier [referee] to quickly render a decision as to the accuracy of the knot. Teams can also opt for bonus points by declaring their desire to untie their respective knots in the maximum time limit allowed for each type (i.e., depending upon the difficulty/complexity ranking of the knot: e.g., 30, 45, 60 seconds for simple, middling, and difficult knots, respectively). Audience members may also vote on the “artistic” value of the “knottings” in each round, and, additional points (or fractions of a point) may be awarded to the team deemed most “artistic” [see: next section]. For example, one team may opt to use their hands (regardless of where on the body the tether is affixed) to help form the loops that a given knot requires, while the other team may forgo the use of hands (to guide the tether) and “work/make the knot” entirely with their bodies. This latter approach is likely more visually elegant (akin to swimming in space) and meriting an extra fraction of a point for artistry [see next section]. For tying the knots, the points are awarded as follows: (completing the knot in) <30 seconds [1.0], < 1 minute (0.5], and < 2 minutes [0.25] for the “mini-g” degree of difficulty (an additional whole number point is added for each higher degree of difficulty [2.0, 3.0]. There are just 3 degrees of knot difficulty in this game. It is possible for competing teams to be working with different degrees of difficulty (e.g., team #1 doing Level 1 knots only, while team #2 does a variety of levels [in the animation: both Orange and Blue teams complete Level 1 knots]). An easier knot may be tied in less time (earning a ‘best time” point award, assuming, say, that both teams tie their respective knots in under 30 seconds), but a higher level knot earns more over-all points, etc. A successful knot replication (determined by a “knottier” or knot judge) in 30 seconds or less earns the maximum score (0.75 point = a successful “knotting” in 30 seconds or less; 0.5 points = for knotting in one minute or less; and 0.25 points = for over 1 minute but less than 2 minutes; the fastest score earns an additional 0.25 points [in the animation: the Orange team’s time is faster, so they earn a slightly higher score]). Additional (bonus) points (not to exceed the fastest time score) may be awarded to the team deemed to have completed their knot in the most “artistic” (or elegant or clever) manner. This would be an audience vote-based point award. As described, there is a time limit of 2 minutes for the tying of any knot (game play/knotting is stopped at the 2 minute mark; there is no penalty for failure to knot in less than 2 minutes UNLESS, upon stoppage, the partially formed knot is wrong (“ill-formed”; incapable of resulting in the selected knot if completed); this would be a penalty of 0.25 point, and is called by the knottier). Such an incorrectly-formed knot (at any stage in the knotting, as judged by the knottier) may require the unsuccessful team to select only from the ‘mini-g’ group of knots (thus less over all points may be awarded) until that knot is successfully replicated. Note 2: For untying the knots (if chosen; teams have this option), a maximum time allotment for untying each knot [e.g., 30, 45, 60 seconds for level 1, 2, 3 knots, respectively] is permitted. Failure to untie in the maximum allotted time (for each knot degree of difficulty) may result in a standard penalty point deduction (- 0.25). Note 3: A “full Gordy” is the achievement of tying the highest level knot in under30 seconds (and in less time than the opposing ream if they also achieve an equal level knotting in < 30 seconds). Fidelity to the pre-selected knot (i.e., accuracy of the replicated knot) — whether chosen randomly, intentionally, or through a “challenge” — must be achieved for any awarding of points. Final validation of this fidelity is determined by real-time photo/video documenting of the finished (astroletes’) knot and comparison of it to the displayed (pre-selected) knot. Once the knot is selected (randomly or by choice or challenge), the astroletes cannot view the selected knot during the knotting phase (only the audience or knottier may see the reference knot) and must complete the knot from memory. However, a team may request a 3 second “knot review” to refresh their memories, but doing so is an automatic deduction of 0.1 points from their knotting score (tallied once the knot is complete). Note 4: the knot must be “tied” adequately in terms of “tightness”, that is, the knot cannot be too loose, such that its untying is too simple/easy (thus also, the awarding of an extra point). Guide marks on the tether (located at a certain defined distance on either side of the center of the tether, with said marks [center of tether, left/right of center a specified distance] being clearly visible) can help astroletes (and the knottier) determine if the knot is tied “tightly enough.” A knot lacking sufficient tightness is determined by the knottier and may result in a small penalty deduction (from the knotting score OR the untying score) of 0.1 points. Note 5: as noted, astroletes must “pull” the knot fairly tight in order to complete the knot. This knot completion could be aided by the astroletes touching a sensor panel on opposite sides of the arena space (similar to the touch sensors Olympic swimmers use in the pool) which both stops the clock and tightens the tether/knot — being space apart a sufficient distance from each other on opposite sides of the arena space (again, the dimensions of the space will determine the ideal/maximum length of the tether). This would be a more advanced way (verses using just marks on the tether). 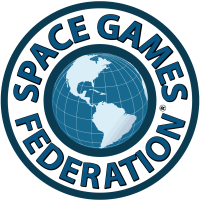 Alternative Play: The game may be played also between/amongst solo astroletes (i.e., one-member teams) via tethering one end of the tether to a designated “anchor” (or pole) installed within the zero-g arena. The rules and goals (selection of knot type and speedy, accurate duplication, and/or rapid “untying”) are otherwise the same (note that there are specific knots, like the clove hitch, that are meant to be tied around a pole, bar, or beam). Solo knotting would allow for an equal (if not more so) degree of artistry in knotting action. Goal/Purpose/Function: Zero-Gordian is a fun, competitive, and physically challenging sport – as well as a cooperative team building game (where team members can freely switch out with any others to form new teams). But what’s more, Zero-Gordian tests/challenges astroletes’ speed and agility in a microgravity environment (which can also serve as practice for space walks and general coordination in space) as well as their mental–visual recall (of the selected knots) and “spatial manipulation” abilities (challenged by the fact that these abilities must be simultaneously coordinated with the teammate one is tethered to – in micro-gravity!). Further, there is an entire branch of mathematics dealing with knot topology that may serve as an extra source of intellectual challenge and stimulation. In its ideal presentation, Zero-Gordian is a synthesis of athletic, artistic, and intellectual abilities. Fan Engagement: In addition to the conventional cheering for one’s favorite team, fans/game observers may “play along” with their own hand-held cords of rope or glow in the dark tethers (provided at the venue or orderable on-line) and time themselves (alongside the astroletes) so as to test their own visual recall and spatial manipulation (knot-tying) abilities. [see: page 5 for a basic table of knots] Audience members also vote on team/solo artistry in regards to any given knotting. Earth-bound fans of the game may also adapt the game to remote-controlled drones – replacing the astroletes with copter-drones (or drones “dressed up” as astronauts) – with each drone controlled by a different teammate (with solo “knotters” also allowed, as noted). This adds another level of technical skill to the core game action. Note 6: the video animation shows a conceptualized representation of one round of Zero Gordian play; the precise movements necessary to actually tie the selected knots are not accurately shown, but abbreviated and idealized. Note 7: This designer is of course aware of the metaphorical/symbolic use of the phrase “tying the knot” to indicate/describe the marriage ceremony. This is not an entirely unwelcome usage (as a pun or joke in reference to game play), but is herein not used (“making” or “working” the knot is preferred). That said, some astrolete may one day opt to use this game as a ploy to propose marriage – or actually “get married” (i.e., “tie the knot”).